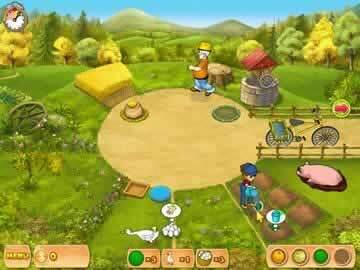 Farm Mania Game - Download and Play Free Version! 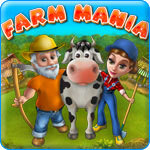 Help Fix Grandpa's Farm and Cultivate the Countryside in Farm Mania! Grandpa's ailing farm is in need of some help and, hopefully, with Anna and friends they can rebuild it to its past glory. Join Anna as she plants vegetables, raises animals, and performs various other tasks around the farm. Whether it's growing pumpkins and cabbage or raising up a little gosling, you'll find a welcome challenge as you attempt to meet each day's goals before the time runs out. While the story might sound similar to other farm-type time management games, the gameplay is definitely above par with catchy tasks and a lively presentation. Where this title really stands out is the variety of challenges one must face, especially later in the game. If you progress far enough, you'll find more challenges than just seeding the earth, watering crops, and picking produce, but you'll have to also manage the maintenance of multiple animals as well. The difficulty manages to be built up at a good pace without overwhelming players, and the option of an untimed game type helps to make this game accessible to even new gamers. What first starts out as a routine time management romp quickly turns into a fast paced clicking frenzy as you try to meet the day's goals in Farm Mania. You'll have to strategically plan ahead your queued up actions if you have any hope of surviving though. 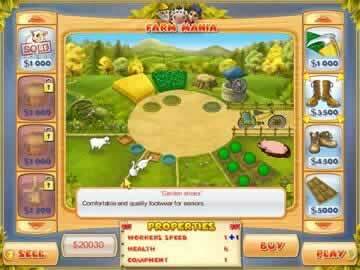 Farm Mania presents a refined and polished farm management game that draws players in with its simple and elegant gameplay and provides hours of entertainment. If you are any fan of farming time management games, then grab your hoe and watering can and download Farm Mania today! See some clips of the various actions which you can perform in order to keep the family farm running.